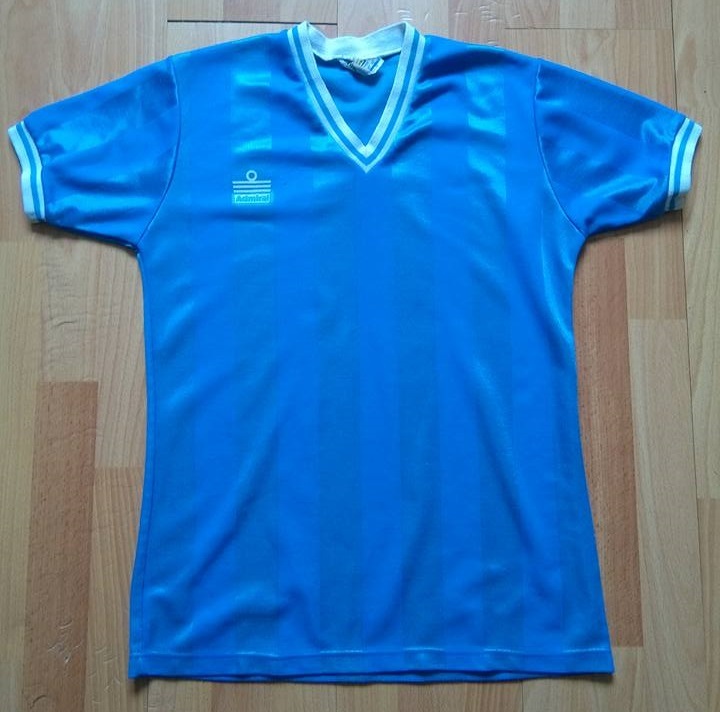 So far in our Retro Shirt Review series we have seen some beautiful obscure vintage tops from the 70s to the early 2000s, made by Erima, Puma, Reebok, Adidas and Umbro. 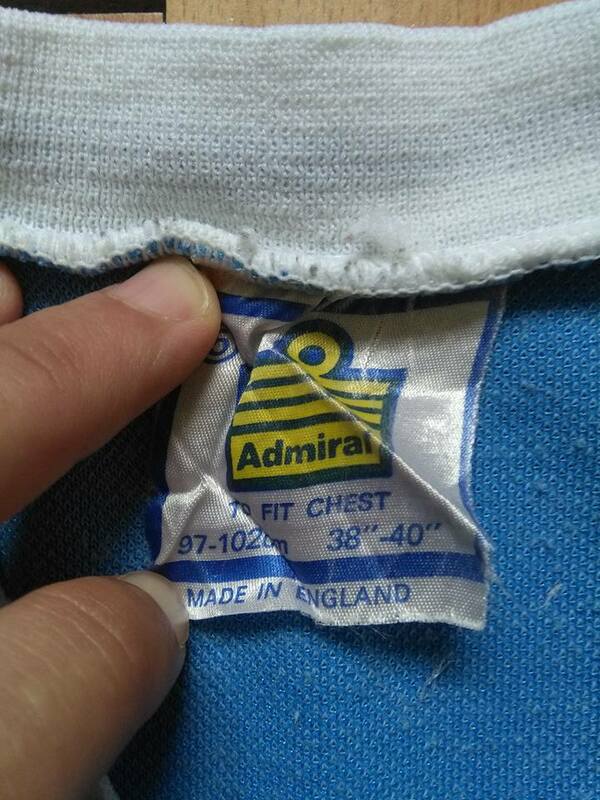 Quite a selection of classic brands, and this streak continues now as we look at a jersey from another amazing shirt maker from the golden age. 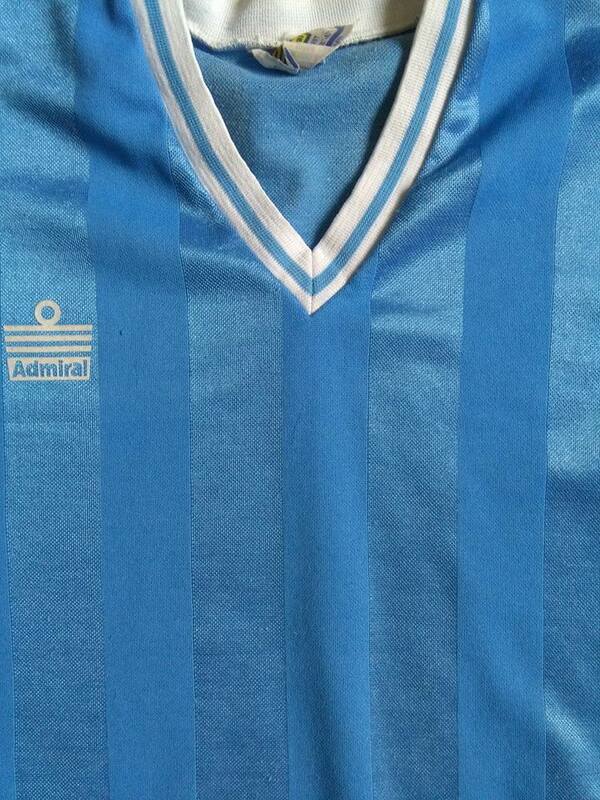 A cool blue line of trim runs through the white sleeve cuffs and v-neck collar – an extremely popular feature on kits at the time. 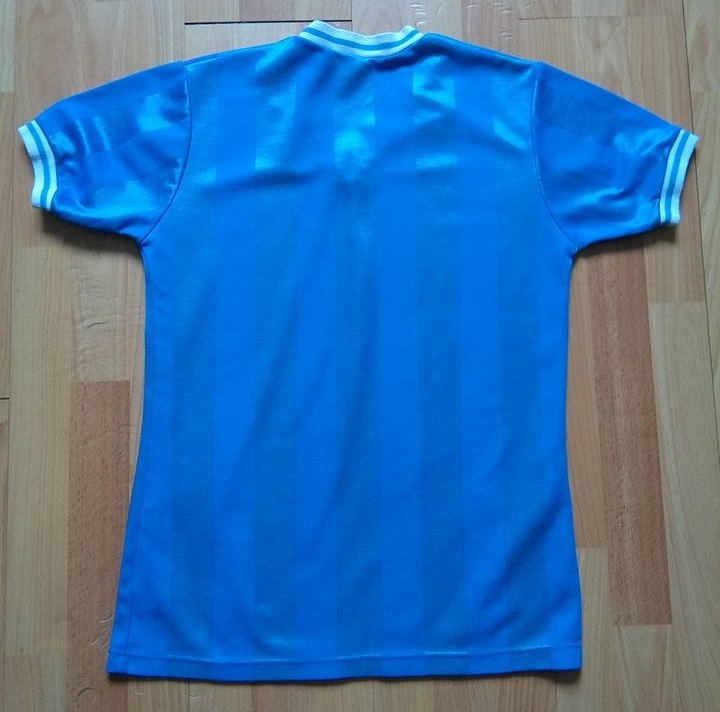 Vertical shadow striping – another popular ’80s design – is also present and comparing the top of the shirt to the bottom in the picture above, the light and dark shade stripes switch depending on how the light is hitting them, which is pretty great. 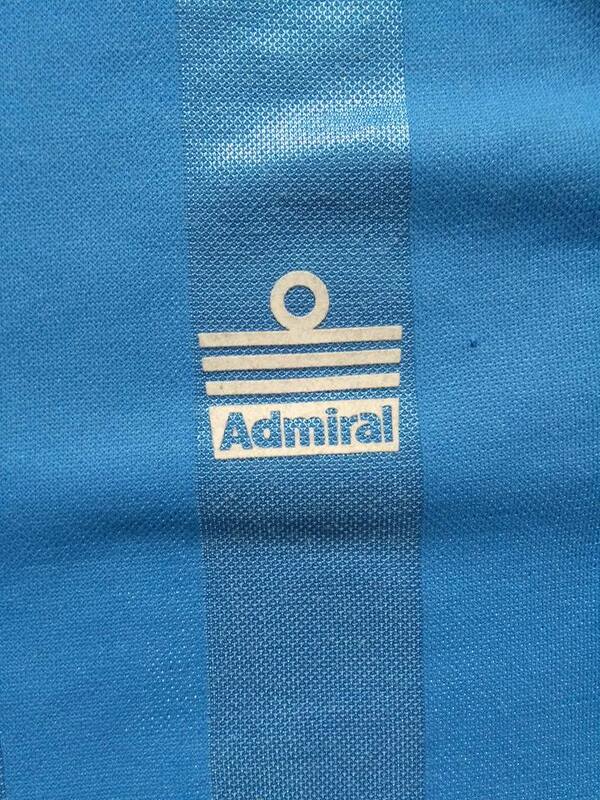 Admiral had began to switch from their turn over/wing-collars of the ’70s to the v-neck design around 1980, most famously with the English national team shirt of ’80-’83. England’s away shirt was red at the time, but we like to imagine our jersey as a perfect fantasy third option for them, as the colour and style sinks up nicely with similar English blue alternate efforts from the period. Bit of a cheat this time for our regular International Selection section, as we don’t have an actual football shirt to show. 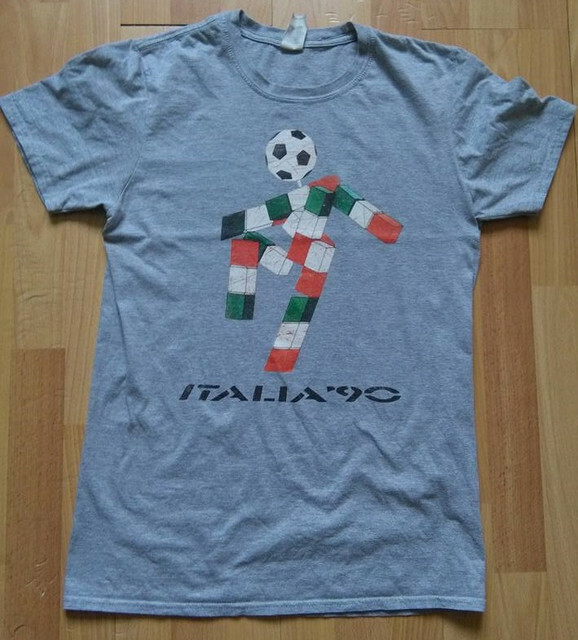 Instead we have chosen to highlight an excellent t-shirt that relates to that most nostalgic of tournaments for a certain age-group: the 1990 World Cup. Yes, it’s the freaky geometric mascot of Italia ’90, named “Ciao”; the greatest World Cup mascot of all time. 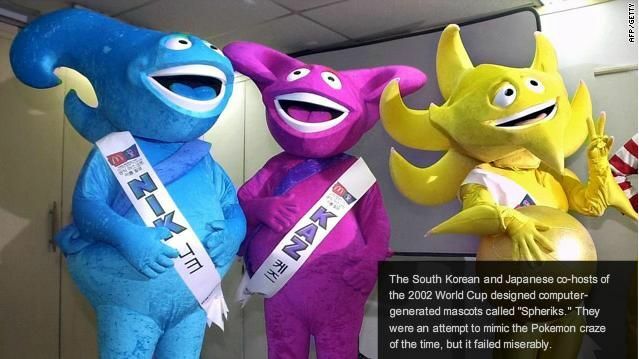 Let us see in a few years time if the 2002 mascots will have aged quite as well.